The island of Skiathos belongs to the group of islands called Sporades. It’s an island with great history as well as remarkable tourist infrastructure. The quality that makes Skiathos special is its natural beauty. Here you can find over sixty beaches with clear blue watters, exceptional cuisin, picturesque alleys and the beautifull natural harbor where you can notice luxurious boats and yaghts. It’s an island where you can combine intense nightlife with relaxing vacations, you can choose from all kinds of fun and recreaction. If you are into sports and you like being in touch with nature the you can choose from twentyfive different trekking routes so that you can get to know the natural wealth of Skiathos. Here is also the birthplace of the great writer Alexandros Papadiamantis. Take some time and visit his old house which is now open to public as Papadiamantis House Museum and get in touch with the greek literature. Bourtzi peninsula is the destination you shound try in order to find your inner peace and be connected with nature. As you sail from a distance you can see the old port and the new commercial one, be separated by the lush bourtzi peninsula. The sightseeing of the destroyed castle and the ruins of Santa George church will travel you back in time and recapture great historical moments. On the opossite side, across the sea, you can visit the uninhabitant island of Tsougria. The absence of man gives you the sense of an exotic place. You will be astonished by the beautiful white beach surroundings and the thick vegetion. You can only reach the place with boats from the nearby port of Skiathos. If you are a nature lover you will get enthousiastic by the lake Strofilia, which is in the western side of Skiathos, nearby Koukounaries beach. Strofilia lake is a natural protected region where you will have the opportunity to admire migratory birds taking a rest, or wonder under the pinetrees. 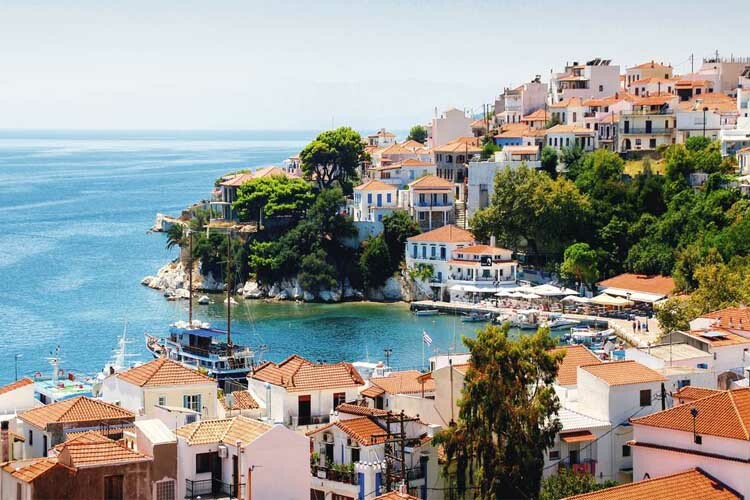 If you and your company have already decided to visit Skiathos island you definitely need to take a look at the hotels on the island. There are some great accommodation choices in Skiathos but you need to harry up because that island is one of the most popular destinations in Greece. Set up your criteria and make your search for everything that you need for your vacations, then you can use the available online booking system. You can also book the airtickets from the online page of the travel agency e-globaltravel. There are a lot of things you are going to see or do on the island of Skiathos, make the right chose and book now your activities.